The Opportunity Rover's dusty self-portrait. 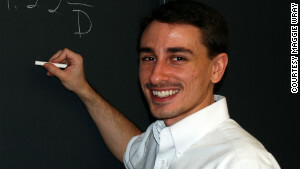 James Wray is an assistant professor of Earth and atmospheric sciences at the Georgia Institute of Technology in Atlanta. He is a collaborator on the Curiosity rover and the Mars Reconnaissance Orbiter science teams. His research explores the chemistry, mineralogy and geology of Martian rocks as records of environmental conditions throughout the planet’s history. In less than a month, the Opportunity rover will begin her 10th year on the surface of Mars. She has already outlived her 90-day warranty 35 times over, like a human living 2,500 years instead of 70 – an astonishing engineering achievement. But how has Mars science advanced during this period? 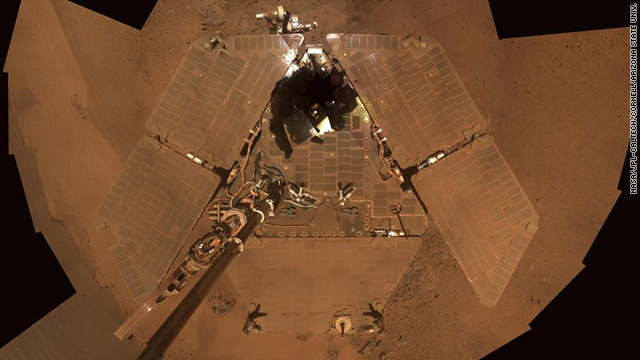 Opportunity and her twin sister, Spirit, went to Mars to determine whether, where, and how liquid water ever flowed across the Martian surface. Before their missions, we knew Mars had dry river valleys, but how could we be sure that water carved them? Where were the minerals that liquid water leaves behind: the clays that dominate our tropical soils on Earth, or salts deposited after evaporation? Opportunity landed on Mars and opened her robotic eyes to a paradise of salt-rich rocks, with the frozen ripples of 3-billion-year-old ponds confirming that water once was there. But as the years passed on, like any Eden, the paradise felt more like a prison, and a heretical plan emerged to journey a seemingly impossible distance in pursuit of new knowledge. Meanwhile, an international orbital armada was beaming back crucial new insights. Infrared spectrometers—first on the European Mars Express, and later the American Mars Reconnaissance Orbiter—showed that sulfate salt deposits like those found by Opportunity are widespread across the Martian tropics. NASA’s veteran Mars Odyssey found that chloride (table salt?) flats were widespread across other regions, implying that the short-lived Martian water was diverse in its chemistry. And perhaps most importantly, the orbiters found clay minerals, which on Earth typically form when water interacts with rocks over millennia or longer. These were found in the oldest terrains of Mars, such as the rim of Endeavour crater, a “mere” dozen miles from where Opportunity landed. So we set out for that far horizon, making “landfall” over a year ago. Opportunity probably sits atop the clays right now, but her two instruments that could directly confirm their presence are now defunct. Ironically, a study published this month suggests that clays may also have been present in the sulfate-rich rocks that Opportunity was so eager to escape. If they were there all along, yet went undetected, then how can we avoid such an outcome in the future? NASA’s newest rover, Curiosity, was sent to Gale crater partly because clay minerals are inferred there, too. Curiosity can identify clays, but only if they are well crystallized; if they are instead non-crystalline or amorphous, as up to half of Martian soils appear to be, then Curiosity’s Chemistry & Mineralogy instrument will provide few new constraints. But Europe is planning another Mars rover to launch in 2018, and NASA recently announced a new Mars rover set to launch two years later. Europe’s rover will (and NASA’s rover should) carry an infrared spectrometer able to locate clays in the same way they are identified from orbit: by analyzing how much light is reflected (not absorbed) by the surface. The relative proportions of each color that are reflected constitute a unique fingerprint for clays and for many other minerals. Ultimately, our mission is not only to explore strange new worlds, but to seek out new life. Curiosity is searching for life’s organic building blocks, and clay minerals seem a promising target: They could not be there if Martian water had been too scarce or too acidic, and organics naturally bind to their “sticky” surfaces. An infrared spectrometer that looks even farther beyond the visible range of colors could detect both clays and organics. But to seek evidence of life itself, for now the consensus is that we’d do best by bringing the Mars rocks back to Earth, where we can unleash all manner of sophisticated lab experiments on them for negligible cost. The first step toward sample return would be for the 2020 rover to store a piece of each auspicious rock it encounters in a “cache,” a bucket that could one day be picked up by another mission—one with the unprecedented capability to not only visit Mars, but to launch back off its surface and return to Earth. Over the past decade we have witnessed truly astronomical progress in our understanding of Mars, from wondering whether it was ever wet, to detailed characterization of the chemistry and habitability of water that we know was there over long time periods. We must not forget that potentially habitable worlds await our attention in the outer solar system and beyond. But for now, it is time to cash (or cache?) in on our decade-long investment in Mars. Enjoyed reading the article and the comments. Life definitely exists on other planets and intelligent life might exist on some distant planet but neither we nor them have the technology to reach to each other. They also might be facing same technology issues (not able to travel fast enough to reach planets billions of light years away). So my guess is that its extremely unlikely that we will ever find out about intelligent life on other planets/moons unless we are extremely lucky. I think its worth investing money in looking for a probably candidate planet for setting up a base of humans where we can go in case something happens and we have to quit earth. Its worth preserving life as it has evolved on earth. The Day we find life on mars, you can bet the Unions will be there in a few weeks to Organize them..
you are looking for an apple that has been bitten twice. In that area there should be a tree and becareful of the snake that lives in it. You can tell me. I'm a doctor. No. I mean I'm just not sure. Well, can't you take a guess? Well, not for another two hours. You can't take a guess for another two hours? i dont really have a good insight just that if u go to mars how will u survive out there sure yeah u will be in a suit but could ur body really handle the kind of temperature on mars even if the chinese get there first so what they would only get only a few hours to explore any ways so what who cares work with them send several shhips up there in different areas so when we get there we all have a certain spot to explore and meet up with eachother at a certain point and get i done rathere than sending them one at a time its just simple logic. The only way we ever could populate Mars would be to have CO2 machines operating round the clock forever and of course, bring algae or moss, that could generate O2 for us. The real problem is that Mars has no revolving inner core, it had cooled millions of years ago. That means NO MAGNETIC SHIELDING so the atmosphere gets wicked away with the solar wind. Give ya one heck of a sunburn too! We would have to live underground. Kinda drag. But if we don't get off this lovely mud ball we are doomed. To power a colony - Run a heat engine to exploit lapse differences. Enough of looking for life...let's go there and actually establish a colony close to one of the poles where the presence of ice has been verified. Then we ourselves be a part of the living few. Idea: leave all the tools who think NASA is pointless on Earth when Mars will be fully terra formed. As a prelude to colonization, the planet's atmosphere should be altered. Space exploration is the one gov't program that needs to be fully funded. At some point we humans are going to strip this planet of it's natural resources and we will have to eventually leave this rock. If it was not for NASA and the military you and I would not be having these little conversations via the internet or have smart phones, GPS, etc. We need to fund agencies like NASA and encourage more private companies to invest in Space Travel. We all know that the Gov't budget is a mess right now, but if we stop funding for NASA we will lose decades of manpower and resources that is needed to travel to Mars. I wonder how the "Magnificent" himself is doing these days. What a waste of financial and human resources. This is not "Star Trek". I have happy ears and my hummingbird likes milk duds more than french fries, hows your mother by the way? Since we are part of one galaxy, it's beeing said the universe has billion of galaxies so logically the universe contains billion of living specimens like us. For one moment do you think the universe exist just for us HALLO!. The universe isGOD no beginning no end the universe always exist .After our own death we will travel to other galaxies like our. kookoo, it was too much for you limited I.Q. On you reply you YOU SAID I WAS "KOOKOO" If you read the article written by Alicia Chance The Associate Press on Jan.7th.2013 Monday by Harvard-Smithsonian Center for Astrophysics, said almost word for word for what I said on my comment. Planning for a colony on mars with this world the way it is? The cart before the horse. What we need to do is discover a 5 km+ asteroid that is primed to hit earth in 100-200 years. The world could come together and space exploration/colonisation would become humanties #1 goal. Funding it would become irrelevant. This is all very exciting stuff. I'm most interested in learning if there is in fact candy on Mars. For years I've been telling girls that's where I go to get my candy bars and right after that I tell them that they go to Jupiter to get more stupider. But in all honesty, I've never really been to Mars. I've always purchased my candy from stores. While I still think girls are stupid, I don't truly believe the reason for this are trips deep into our solar system. I simply liked the rhyme. Girls would be stupid no matter what. Jupiter probably has absolutely nothing to do with it. This is why I'm now somewhat skeptical about Mars and candy bars. But I will point out that if you look on some candy bar wrappers, the word "Mars" is on them... and I know I'm not imagining this. Mars in 2013 is like North America in 1492: a huge and hostile land mass far far away from known civilisations (earth in our time, Europ in Columbus time). If we discover that life once existed on Mars, we could speculate that it should be possible to create the same conditions (terraform) on that planet for life to flourish again one day. As of today, the technologies required to reach and to live on Mars are expensive, but can we say the same thing 20-50 years from now? In the meantime, if we do nothing, the future Martians will surely speak Mandarin (chinese). I agree. If we don't start investing in NASA then China will be the first people landing on Mars, insuring their economic dominance and becoming the new superpower in the world. @Bob and @I am god: are you afraid of China becoming a super power? Then be prepared for a lifelong frustration beginning in as soon as 20 years from now. China will be by far the number 1 economic power on this planet for many years to come. I'm not afraid of it, i just can't speak mandarin... If they feel the need to go to Mars, then they will certainly be there before the US. It's the most populous country in the world, after all. Nothing wrong with it. It is "cash" not "cache". You "cash in", you dont "cache in"
lol... he was trying to make a pun. He was referring to the possibility of creating a cache of rocks that would be brought back by a later ship. Forget the focus on search for life. Set up a colony then we can do all the searching we want. P.S. Should have had a moon base years ago, would be much easier to go to Mars. I agree. Start with a moon base from which a significant, possibly manned Mars mission can be launched. Yes! All we have to do is print a few hundred billion Mars Dollars!!! The cost of such a mission is prohibitive. Period! 1) Extreme religious freaks that don't want to believe in other planets, because it goes against their religious ideology. 3.) A group of conspiracy theorists that still believe we never landed on the moon. Just because a planet (Mars, Venus, etc.) dosn't have life now dosn't mean it never did. Just because we can not prove 100% that there once was life on a barren planet dosn't mean there is a 100% certanty that there never was. Earth, our home planet, was once as barren and lifless as all the others are now, and one day, untold years in the future, it will return to the giant bald dirt ball it once was. How that comes about is up to fate, expansion of the sun cooking the planet, war, famine, lack of resources, alien invasion, take your pick, but one day some other race may look at the barren waste land that is Earth and ask the same questions about it that we are. But we will never really know, will we? Thank you Ken B. Asdhj, please emplain how I am a moron. I seriously want to know, please tell me. I don't get it. He used perfectly reasonable logic.. Is it the alien thing? you do know that it is a statistical certainty that there is intelligent life out there. It is estimated that there are 9,000,000,000,000,000,000,000 stars in the universe, so odds are there is intelligent life out there. Great lets waste even more Billions to get more pictures of dirt from mars while our debt is already at over 16 Trillion Dollars and keeps exploding upwards. I have nothing against space research but we are literally talking about borrowing from the likes of China and so many others to pay for these space missions. That's not a smart investment no matter how much some delude themselves. For every scientists and their equipment you can keep at least a hundred ordinary folks at work by fedarally stimulating their lower wage, lower operating cost jobs. Their are still thousands of unsolved deceases killing millions per year. Lets invest the money here on earth. Or in space projects that can generate cash like mining astroids or as is being done partially the stimulation of the commercial space sector. Expand on things that generate cash. Less sick people also help the economy, better education also helps the economy. 2.5 Billion mars rover hardly does. Neither due bullets and bombs. Your post is completely functionally illiterate. Until you can spell and construct a grammatically correct sentence, you should leave the posting to educated people. You're correcting this commenter's grammar while thinking that "completely functionally illiterate" is grammatically correct? Try simply "functionally illiterate." Not a smart invetstment? We now now that Mars was once a warm place with an atmosphere and flowing water, and now is a cold, barren, lifeless wasteland. Similarly we now know Venus, Earths twin, was changed into a horrible Hell of a place, where its 600 degrees and rains sulfuric acid. The amount of money that space exploration contributes to the debt is incredibly small. There are much bigger fish to fry when talking about cutting programs to reduce the debt than NASA. I find that this same argument is usually spouted out by those who are completely ignorant on the contributions to society directly due to space exploration. Do some google searching. If we worry about the deficit so much that we cannot invest in seeking the truth about origins of life, we should just throw out science in schools and replace our text books with bibles. Mars is probably made of the same stuff earth is. There is probably gold, silver, iron, aluminum, copper, and a lot of things. And the REALLY important thing is that if it were once like earth, there could potentially be oil under the surface. Let's remember they landed curiosity in a HUGE crater where everything was vaprized! Is their life where everything was once vaporized by a meteor? I study microbes that live in an area that was once vaporized by a nuclear device... so it is not completely unreasonable to in a crater site for life. It never ceases to amaze me how small minded people are that they believe the research NASA does has not directly affected their lives. Cell phone technology, miniturazation of the micro chip, polymers for clothing, electro magnetic technology for better power production. All of these have led to new job creation both in our country and abraod. My wife works for NASA as do thousands of other residents here on the Space Coast and in Houston and California. Would you all decry those jobs? Have them just go away further demolishing the economies of these cities? Before you demonize NASA and their contractors please do some research on how much the space program has given our nation. It’s people like you that were so sure the earth was flat that there was no need to try and find a new route to China because you would just fall off the edge of the planet so why try. The last two wars we had could have easily funded a manned mission to Mars. Think of all the jobs that would have created. Instead, we have lots of death, more people hating the US, and far less jobs. Very insightful and sadly true. Yes, Alex, one of the most pressing problems that we do have at home is the existence of ignorant people in the begining of 21st century that still see no value of space exploration. I prefer robotic missions over manned plans for Mars. A robotic sample return would be nice. I would like to see a list of experiments planned for Mars that can only be performed on Earth. If we had a permanent manned presence on the moon, we could deliver robotically retrieved samples from Mars there and minimize the risk of cross contamination. How can water have ever flowed on the surface of Mars given that there is not enough gravity on the red planet to keep it from vaporizing and escaping into space? It can only exist in it's frozen state. Ahhh, physics as we know it may be different on other panets or in other galaxies. We are searching beyond ourselves when we haven't even finished developing ourselves. ...Wrong...... first of all there is plenty of gravity on Mars to hold water on the surface..... and 2nd there are the same laws of physics on every planet. I think you missed a few of your science classes. Your thinking of the atmospheric layers, which help keep water from vaporizing, kept air/oxygen on the planet. All that could have been destroy years ago with a Meteorite, or was naturally unstable and over time dissipated. All this is very interesting and eventually will be useful. As we explore more places in detail, we may find that life in some form is present almost everywhere, just as we have found that nearly every star has planets. NASA needs to explore the Moon with the same attention it's giving to Mars. I look forward to seeing the results from the twin orbiters that were measuring gravity variaitons on the Moon, because they might reveal the presence of caves. NASA should send robots to sites that may have caves to find the caves and see if they can be used as bases for Moon colonies. We may find that life in some form is present almost everywhere" – or we might not. It is an extreme stretch from the little bit of information in this article to confirming that there is, or was, life on Mars.